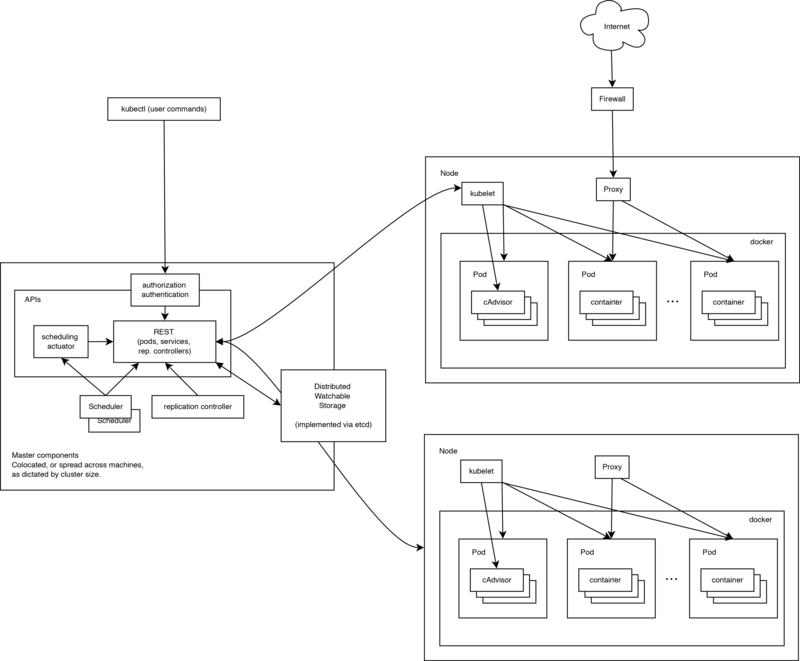 Above is the Kubernetes design architecture. In my POC environment, I have written a script to install and configure the kubernetes. I have tested it on the RHEL 7, I think it should work on CentOS 7 as well but have not tested yet. Please be aware that the script uses the latest codes from kubernetes git repo. The script may not work due to changes in the future, for exmaple deprecated paramters. But I will try to keep it up to date. 1) Install docker, which is the fundamental container application. The script uses zzdocker0 to replace the default bridge docker0, as some applications (e.g facter) uses the first non 127.x.x.x IP address as the primary IP address of the host. 2) Install flannel, which provides the backend overlay network. It allows the communication between containers on different hosts. 3) Install etcd on master, which is a distributed key value store. It is for shared configuration and service discovery. 2) Define master IP address, and proxy if needed. What should be GOPATH ?